Be the first to share your favorite memory, photo or story of Virginia "Joan". This memorial page is dedicated for family, friends and future generations to celebrate the life of their loved one. 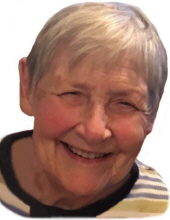 Virginia “Joan” C. Myers, 92, of Napoleon, passed away on Saturday, April 6, 2019 at her home. She was born September 5, 1926, in West Liberty, Ohio to the late Bernard and Margaret (Bower) Cook. She married Franklyn Gwynn Myers on August 8, 1954, and he preceded her in death on May 24, 1984. She was also preceded in death by one son, John F. Myers on September 16, 2011, and an infant brother, William Roger Cook. Joan is survived by one daughter, Jayne Anne Myers, of Napoleon; one granddaughter, Carlee Margaret Hohenbrink, also of Napoleon; sister-in-law, Peggy Wilkins, of West Liberty; caregiver, and special friend, Peggy Fausey, of Napoleon, who selflessly and compassionately devoted her love for her. Joan was raised with Phyllis Ackley, whom she continued to have a special bond with though out her life, as well as Wanda McBride, who preceded her in death. Joan graduated from Bellefontaine High School in 1944, and was a 1948 Bowling Green State University graduate, where she received a Bachelor of Science degree in Education. She taught in Findlay, Bellefontaine and Napoleon city schools for a total of 33 ½ years, retiring in 1981. She was a member of the Henry County Retired Teachers Association, the Order of Eastern Stars of Deshler, Chapter # 68, and a member of St. Paul United Methodist Church, and the United Methodist Women. She was also a former member of the Harrison Garden Club, and the Napoleon Buckeyes of the National Campers and Hikers Association. Visitation will be held from 1- 3:30 p.m., on Monday, April 15, 2019 at Walker-Hoening Mortuary, 333 W. Main St., Napoleon. Funeral services will begin at 3:30 p.m. at the funeral home, officiated by Rev. Michael Westbay. She will be laid to rest privately in Glenwood Cemetery, in Napoleon. In lieu of flowers memorial contribution may be considered to her granddaughter Carlee for her education, St. Paul Methodist Church, or Heartland Hospice, Perrysburg. To send flowers or a remembrance gift to the family of Virginia "Joan" C. Myers, please visit our Tribute Store. c/o 333 West Main St.
"Email Address" would like to share the life celebration of Virginia "Joan" C. Myers. Click on the "link" to go to share a favorite memory or leave a condolence message for the family.